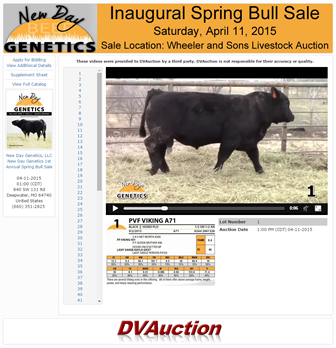 Thank you for booking your sale with DVAuction -- the livestock industry's leading online marketplace! You will soon be receiving a contract in the mail and via email. Please fill out and send this contract back along with 50% of the broadcasting fee (an envelope will be provided). The balance of the fee will be due after the sale. Capitalize on the power of advertising! In order to make the most of your investment, it is essential to include DV logos with on all your advertising-that way prospective buyers that know they can’t attend the sale will still inquire for more information. Proxy bidding (placing a bid in our system without being present during the time of the auction) will also allow buyers that are too busy to watch the sale make their purchases. 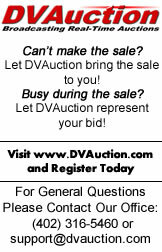 When fielding calls about the sale, don’t forget to remind buyers to visit your DVA online listing for a map, online catalog and more sale information. A suitable on-site internet connection is an important part of making sure that your customers receive the best in auction broadcasting, and that your sale won’t miss any bids! If a DVA representative hasn’t already requested it, please be certain to provide your internet service provider information including company contact info, internet type (DSL, Cable, Broadband, Etc), connection location, and upload and download speed. Upload and download speed measures the strength and consistency of your internet signal-a minimum of 500 kb/sec upload and 500 kb/sec download is suggested. In order to measure this, simply log on to speakeasy.net/speedtest and click the name of the city nearest you. You will then see a red ball run along the track, measuring download speed. A steady, strong signal will cause the ball to move fluidly-if it is jerky or stops please let your DVA booking rep know. After the download speed is measured, the ball will then return on the track, measuring upload speed. In order to accurately measure this important value, we usually take at least 3 tests from that location. 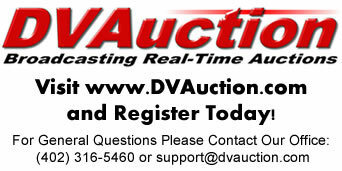 You can then email the average upload and download speeds to dva@dvauction.com. Also be sure to contact your internet provider to allow DVA to have access to your account in order to find out if there is something that can be done to maximize the internet service for your sale. 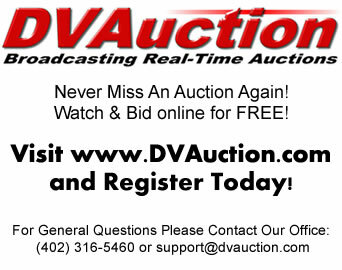 Email a pdf of your catalog to dva@dvauction.com for your sale listing. Please identify it with your sale name in the subject line. 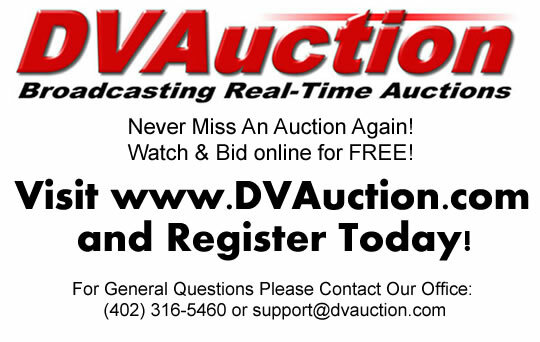 We know that it’s safe and easy to buy on DVAuction, but it’s important to communicate this to your buyers. 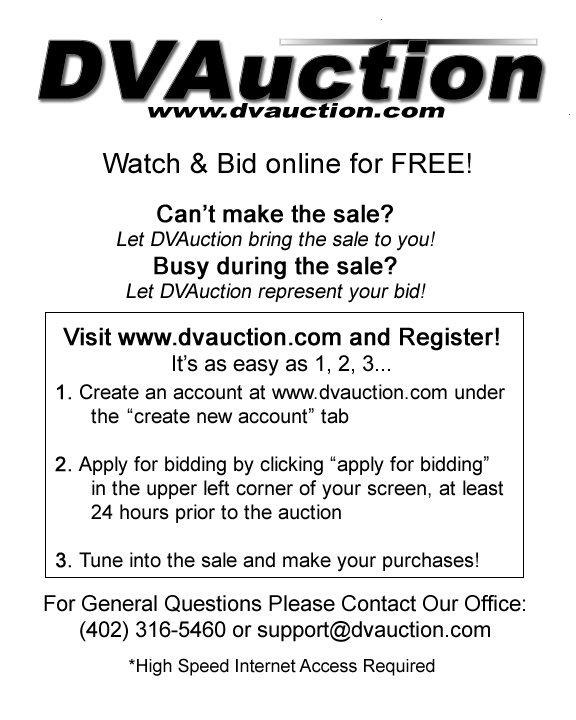 Please use these instructions in your sale catalog with a DVAuction logo (provided below). 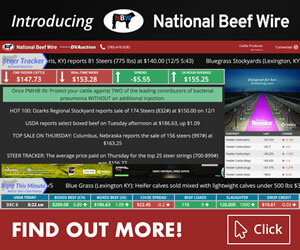 Reach over 100,000 in the livestock industry, the largest list of its kind! Reach over 100,000 livestock producers with one email! Our staff will custom design an email broadcast that can include links to your website, online catalog, DVAuction listing, or video page. This eye-appealing marketing piece can then be sent to the largest list in the livestock industry! Send it more than once for the utmost in effectiveness-this is a great way to highlight your special lots, provide last second sale information, or simply drive attention to your sale. SPECIES TARGETED, GEOGRAPHICALLY TARGETED, AND TOTAL LIST BLASTS AVAILABLE. Check out some of our past e-blasts to see what we can do for you! Our team will then create professionally edited DVDs, post to your website, or help transform this video or photographs into a valuable tool for your promotional efforts. We can also offer an on-site sale day viewing service, allowing you to sell your animals without the stress of bringing them into the ring. Set up includes 3 flat screen TVs, projector, and on-site operator. Have at least three helpers on shooting day, one on each side of the pen and one always bringing cattle to the pen. These helpers should be experienced in handling cattle, and careful about being overly loud or hurrying the cattle. At the same time, there should always be an animal ready to come into the pen to be certain that we are efficient in our time management. For example, if you hope to shoot 120 head in a day, but have to wait 1 minute for each animal to be brought in, that "down time" amounts to 2 hours-which means time is being wasted that could have been used for shooting or finishing the day earlier. The help needs to also understand the goals of shooting (alert, walking footage)-with clear direction of how the cattle will move through the pen. They should also be coached on how to assist the videographer with obtaining tag numbers for video IDs. Set your pen or select a pre-existing pen that is as level as possible, with a smooth ground surface to minimize animal stumbling. 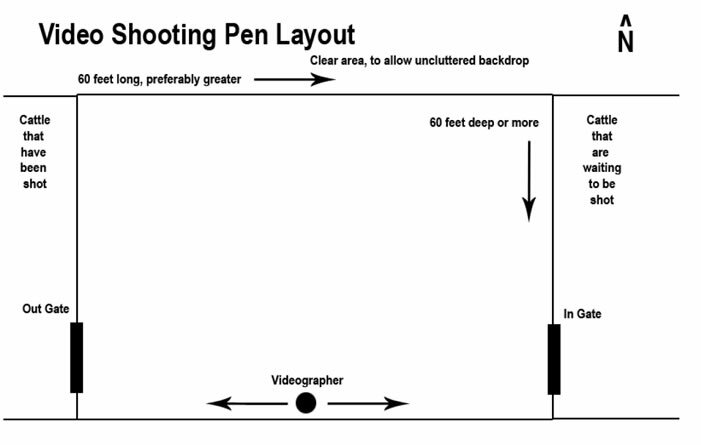 A flat pen allows the videographer to shoot footage with the animal going in each direction, which creates less time for that animal in the video pen (and stress) and provides a better perspective of the animal. Mowed grass is the most eye-appealing footing, but straw, shredded hay or shredded cornstalks work well to cover dirt and add eye appeal. If you use any of these coverings, be sure they are not too deep (9 inches or less) which may impede the animals walking. A dirt footing is not a major issue, as the viewer’s eye will be more on the animal moving, and not as much on the background or footing. The videographer will always shoot with the sun at their back, so plan for them to shoot facing the Northwest in the morning, straight North in the mid part of the day, and the Northeast later in the day. This minimizes shadows on the animal, which detract power and eye appeal from the subject. Plan on the pen being at least 60 feet long or greater in length, realizing that the longer the pen, the longer the video clip, and the more likely the animal is to stride out comfortably straight down the pen. This is another reason why it’s important to have two helpers in the pen, so one can work on each side "ping ponging" the animal back and forth. Also plan on the depth of the pen to be at least 60 feet or greater-this keeps the videographer out of the animal’s flight zone, which again aids in a comfortable walk for the animal down the pen with no distractions. Generally most pens that we work in have square corners, which is ok. By properly handling the animals prior to them reaching the video pen, you shouldn’t have issues with the animals hiding in these corners or trying to jump out of them. If you do round the corners, do not round the whole pen, as that minimizes the amount of time that a true walking profile can be filmed. In these cases you have more of a rear three-quarter shot, profile, and then front three-quarter. Print advertising is available through The Stock Exchange News, the official publication of DVAuction. 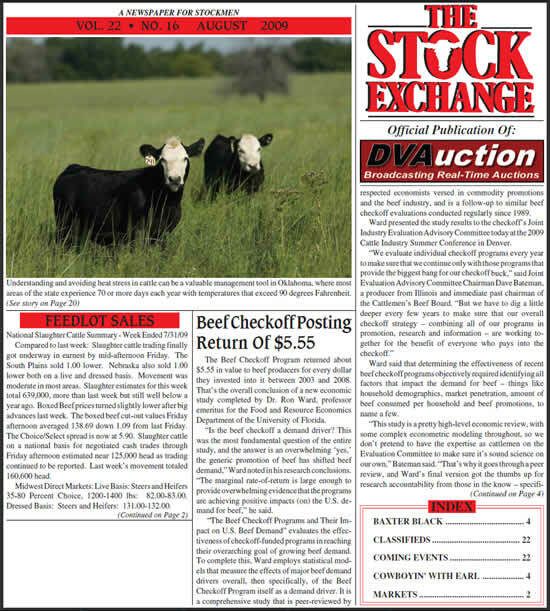 Published 17 times annually, The Stock Exchange reaches thousands of loyal readers in the livestock industry. Industry relevant editorial, latest happenings, and market reports keep readers from across the country subscribing year after year providing a valuable marketplace for you! Banner ads that link directly to your website or DVAuction event listing can be a powerful tool in driving attention to your sale. 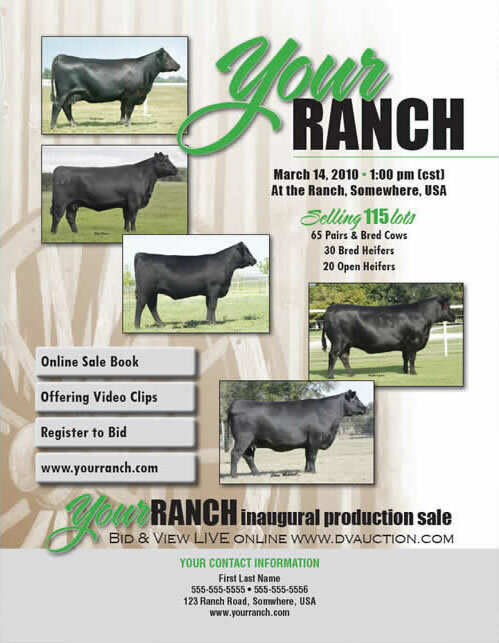 Please contact your DVAuction Rep or Jason Ronsse at (785) 410-3282 (jronsse@dvauction.com) for pricing and placement options! Pre-made ads are accepted in JPEG (.jpg/.jpeg), GIF (.gif), or Flash (.swf) format. Custom-designed ads are available starting at $100.00. Be sure to include the URL to which the ad should be linked! Below are size specifications in pixels for pre-made banner ads. Your ad must conform to the size specifications for the placement position you are requesting. These are specific to placement positions on DVAuction only. Below are size specifications in pixels for pre-made banner ads. Your ad must conform to the size specifications for the placement position you are requesting. These are specific to placement positions on The Stock Exchange News only.